I had a feeling this wouldn't be my kind of dish, but eggplant has been kind to me recently so I thought maybe I'd be surprised. Wrong! If you like eggplant and mushrooms, try this dish...otherwise, pass it up quickly. This is supposed to be a take on the Austrian classic schnitzel, a breaded and fried veal cutlet served with lemons and lingonberry jam. 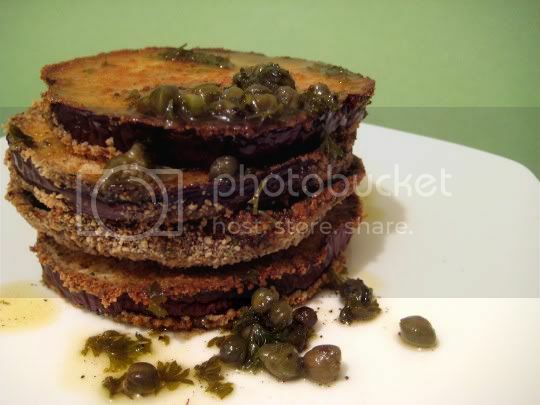 This vegetarian version uses eggplant slices and portobello caps, which are breaded and oven-baked until crispy. The sauce is mixture of butter, olive oil, salty capers, fresh parsley, and tangy lemon juice. LOTS of lemon juice. The sauce is VERY lemony, and I can see how it works well with the crispy savory veggies...but the enjoyment is short-lived. The capers add almost a seafood-like flavor to the sauce, and the additional tanginess is just too much with the lemon juice. I can see why schnitzel is usually served with lingonberry jam, because my mouth puckered so much that I almost ran for the first sugary thing I could find! At least I was smart enough to halve the recipe from the start, so there wasn't too much to throw away!